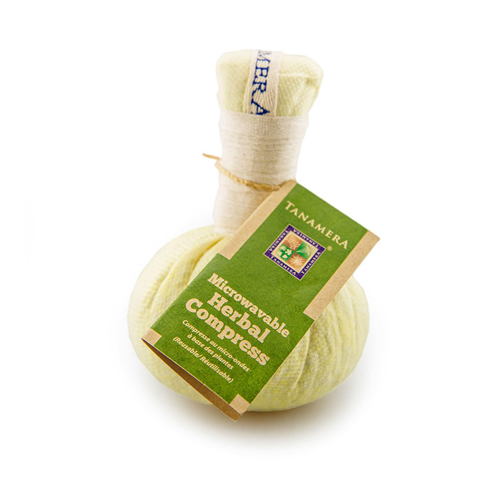 A great compress made for those on the go and lack the time to prepare compresses the traditional way. A rich blend of sea salt, organic brown rice and freshly harvested herbs wrapped in a special fire retardant material so it can be safely heated in the microwave.Will help to relieve muscular aches and pain and will improve blood circulation in the treated area. Contain the amazing goodness of Bengal ginger, Clove, Turmeric, Kaffir Lime, Organic brown Rice and Sea salt. Heat the compress in the microwave for 1 minute before applying on the desired area. Wait for it to cool before reheating. Wait to cool before putting it in a sealed plastic bag to store.NoteReusable for 6 months if kept in a dry cool place.